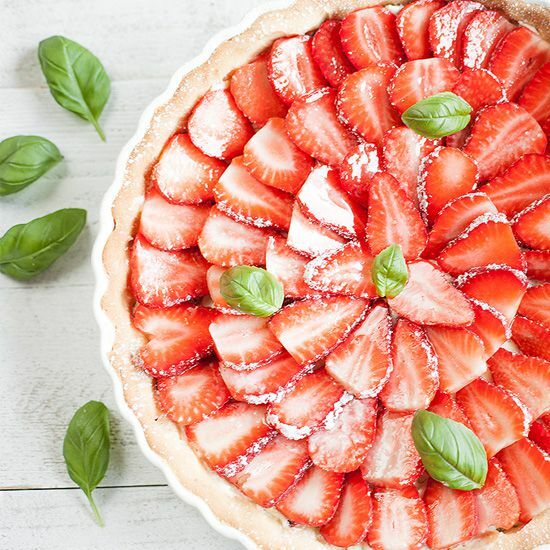 Very refreshing strawberry basil pie that looks beautiful and the taste is absolutely amazing! Ready in about 1 hour. Strip the basil leaves from their stems and finely chop the white chocolate. Grate the lemon to create the zest and squeeze the juice out of the lemon. Place the gelatin leaves in cold water, this way the leaves will soften. Cook the basil stems with 1/2 a cup of the cream in a small saucepan on low heat for about 5 minutes. Strain the cream and throw out the basil stems. Squeeze the water out of the gelatin leaves and dissolve in the hot basil infused cream. Also dissolve the chopped white chocolate into the hot cream. Add the lemon zest and juice and set the mixture aside for a few minutes. 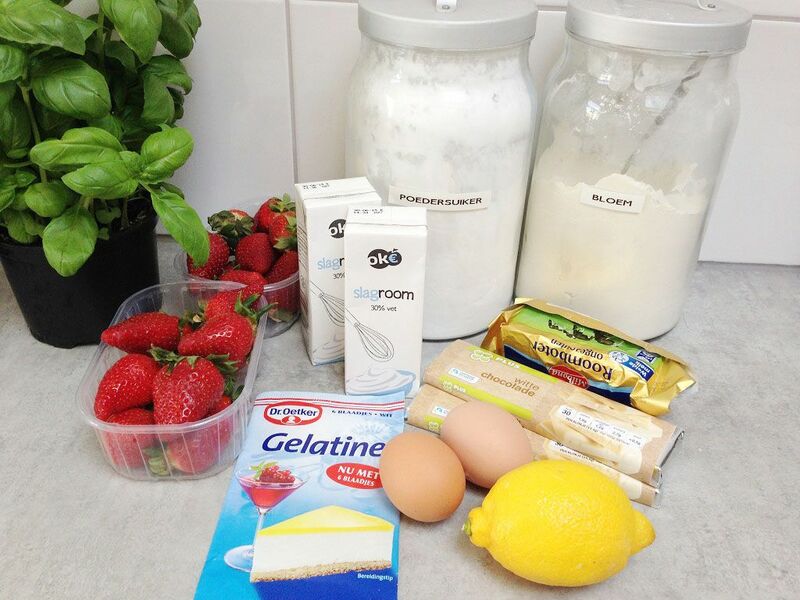 Meanwhile whip up the other 1/2 a cup cream. Chop the basil leaves and mix those together with the whipped cream into the cream. Now it’s time to let the basil cream cool off completely. Grate the lemon to create the lemon zest and slice the butter into cubes. Combine the all-purpose flour, butter, lemon zest and powdered sugar. The structure of this particular dough will be a bit like sand. Add the egg and egg yolk and mix it some more. When it forms a dough ball, wrap it in cling film and refrigerate for 20 minutes. Use a silicone kitchen brush to butter the inside of the baking tin. Use a rolling-pin to create a very thin dough crust, don’t forget to use a little bit more flour to prevent sticking. Also use the rolling-pin to transfer the dough onto the baking tin and cut the overlapping dough. Puncture small holes into the pie crust, for example using a fork. Place exactly fitting parchment paper on top of the crust and fill it up with blind-baking beans. Now bake the pie crust for about 20 minutes in an 180 degrees celsius or 350 degrees fahrenheit oven. Remove the baking beans and parchment paper and bake the crust another 5 minutes to create its golden brown color. Let the pie crust cool off completely. Divide the basil cream over the pie crust. 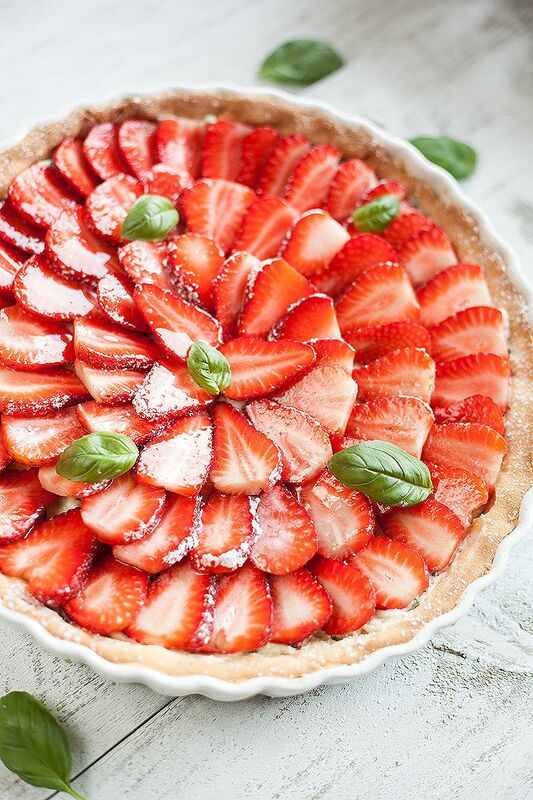 Wash, and cut the fresh strawberries in thin slices. For a best result the slices should be cut in the same thickness. 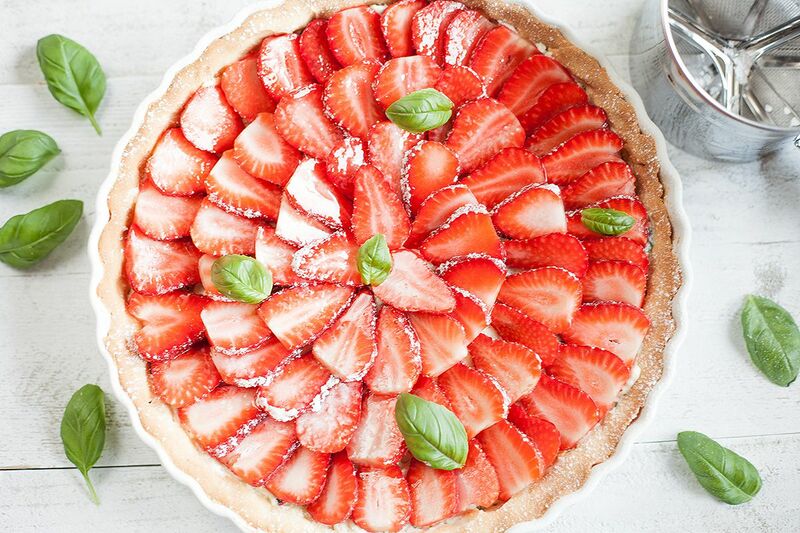 If you like, you can dust the pie with extra powdered sugar and top it off with a few extra basil leaves. Enjoy!